At the first place, I don’t really know the reason why the DOM inspector is installed by default in Firefox. This is a highly advanced web developer feature. Normal users like you and me at application level do not require it at all. The only reason I can think of is majority of Fifefox’s users are web developers. Therefore, it is installed by default. But since Firefox has now become so popular, I think it should installed by default as most normal users do not use it. I think I read it somewhere in the latest releases of firefox, the DOM Inspestor has no longer installed by default? I can’t be sure because I haven’t tried the new installation. I usually just do the auto update from the existing Firefox. So if you do not use DOM inspector in the Firefox, I would recommend you to uninstall DOM Inspector in Firefox for better memory resources and performance. To uninstall, just go to Tools -> Add-ons and select the Add-ons that you would like to uninstall. Btw, if you think this DOM inspector could be useful to normal users, please share with me. Then probably we (as a normal users) shouldn’t uninstall this cool stuff. :) I don't see how benefits this inspector and it is only meant for web developers. Have you ever had problem to run the default defragment tools from MS Windows for few hours but still haven’t completed? Then the Auslogics Disk Defrag would probably the solution that you’re looking for. I used to run Windows defragment for 2-3 hours. During the defragmentation, I can’t use my laptop or PC at all so it ends up I wasted my time doing nothing for few hours. So usually what I did is to run the defragmentation before I go to sleep. Now with the Auslogics Disk Defrag I no longer need to do defragment before I go to sleep because it reduce the 2-3 hours defragmentation to less than 20 minutes. I usually just run the defragmentation before I take my shower. After my shower, everything is done then. :) It saves my time a lot. 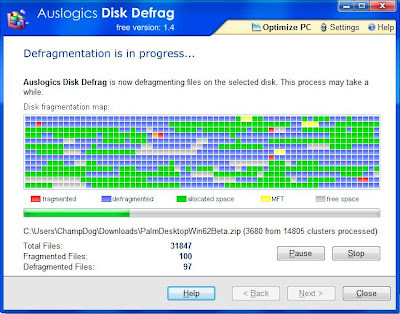 To try out the tool, download Auslogics Disk Defrag here. 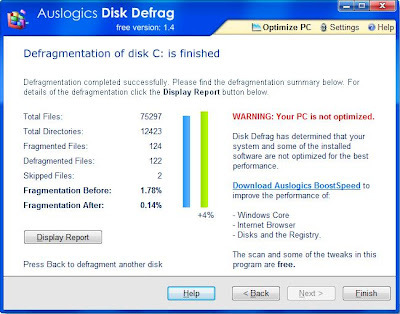 When the defragmentation is finished, you may see this warning “WARNING: Your PC is not optimized” and asking you to “Download Auslogics BoostSpeed” to improve the performance of your PC. It is not FREE. After the expiration date, you need to pay for it to get the full features. It doesn’t improve my laptop’s performance. At least I can’t feel it. Enjoy the fastest defragment tool from Auslogics! You will be surprised how fast this tool can go and save your precious time!